Since its inception in September 2016, AVIXA’s monthly Pro-AV Business Index has shown 24 consecutive months of sales and employment growth, demonstrating a healthy industry. The latest report shows the AV Sales Index for August 2018 was up to 67.2 from July’s 64.6. With an overall positive economy to close out the summer, this is up 8.8 points from a year ago. Survey respondents cited year-end spending as a reason for expected growth through the end of 2018. “Federal year-end spending has increased quick-turn project spending. Budgeting for the new year appears to include some significant spending on AV refresh and new construction,” said one North American systems integrator. The Pro-AV Business Index is created from a monthly survey tracking business trends. The report actually comprises two diffusion indexes: the AV Sales Index (AVI-S) and the AV Employment Index (AVI-E). 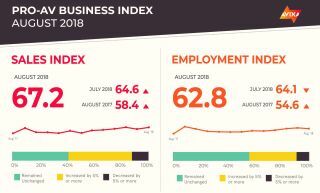 In both cases, an index of 50 indicates firms saw neither an increase nor a decline in sales or employment activity; an index over 50 indicates an increase, while an index under 50 indicates a decline. “The sales and employment indices continue to show a healthy AV industry, which is consistent with the annual IOTA reports showing year-over-year growth out to 2023,” said Sean Wargo, AVIXA’s senior director of market intelligence. According to AVIXA’s 2018 Industry Outlook and Trends Analysis (IOTA), the pro AV industry will generate $186 billion globally in 2018 and is forecasted to reach $230 billion in 2023 (www.avixa.org/IOTA). The full Pro-AV Business Index is free to download. Visit www.avixa.org/AVindex to access the monthly reports and learn more about the methodology.